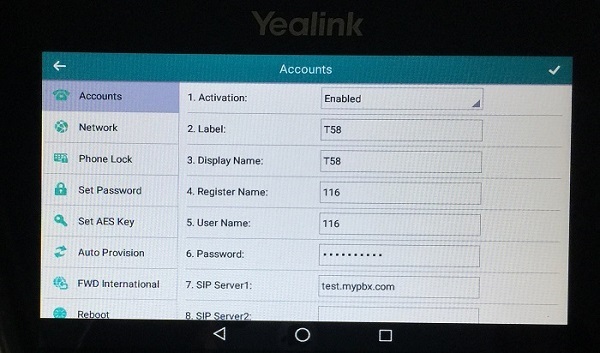 The Yealink T58V is a smart media phone based on the Android 5.1.1 operating system. Supporting High Definition audio and video, built-in WiFi and Bluetooth and support for the Opus codec, this IP phone certainly has impressive specifications. In this review we provide the pros and cons along with our editor ratings for the Yealink T58V. Following that we will detail the steps needed to setup this smart media phone. First of all, the T58V is an elegant looking phone with impressive specifications. Any executive or manager looking for a stylish and professional looking smart media phone will not be disappointed. The T5x series uses the Android 5.1.1 operating system. This was a smart move by Yealink for a number of reasons. For starters, it is aligned with one of the most popular operating systems in the world and used on many of the top smart phones in the market place. It also gives Yealink the ability to offer productivity enhancing Apps on the phone such as a calendar, email, messaging, recorder and a file manager and photo gallery. It also has a full Web browser (Figure 4), which could be useful. Android also helps with window stacking, as you can now easily switch between different windows and Apps on the phone (use the square icon at the bottom of the display). If you are not familiar with Android then it may take a little time to get up to speed on using the Android User Interface at first but it will grow on you. The phone supports full video at 720p (30 frames per second). The CAM50 plug and play camera connects to the top USB2.0 port and has a 2 Mega-pixel image sensor and a nice wide viewing angle. It is adjustable on the vertical plane which is useful and we like that it has an LED indicator and more importantly a privacy shutter, which seems to be a must-have these days! The 7-inch back-lit LCD display has a 1024 x 600 resolution and has capacitive touch screen. We really like the touch screen feature as it makes it really easy to add DSS keys to the display (up to 27) for speed dial, BLF and the likes. WiFi (802.11 b/g/n) is built-in to the T58V, so no need to purchase a WF40 WiFi adapter, which has the added benefit of leaving you with a free USB2.0 port for call recording, USB headsets or other functionality. Similarly, there is no need for a BT40 Bluetooth USB adapter, it is built into the T58V and supports Bluetooth 4.0+ EDR, and very useful for Bluetooth headsets. There are also two hard-wired Gigabit Ethernet ports (built in switch) and we always recommend using this rather than WiFi. The second port can be used to connect to a downline PC and the Gigabit speed future proofs your system. The voice quality is outstanding on this phone, as you would expect from Yealink and its high end phones and it is worth taking advantage of the Opus Codec, if your provider supports it, to obtain full and scalable HD audio. Opus is a completely open source standard so there is no license fee to use it. The speakerphone audio is also very clear, as a general side note remember to hang up the handset when you wish to use the speakerphone so it uses the microphone on the desk phone rather than the handset microphone. It is also worth noting that the handset is Hearing Aid Compatible (HAC). Yealink has created a new expansion device (EXP50, see Figure 3) for the T5x series of phones. It is a great upgrade since it has a large 4.3" color display with 20 buttons in 2 columns and 3 page buttons, thus providing up to 60 buttons and features. This is very useful for receptionists that handle large call volume since you can configure the buttons for speed dial, BLF, call forward, transfer, pickup, park and much more. To program one of the buttons, simply hold the button for 5 seconds and it will appear on the main display for the T5x phone. You can daisy-chain up to 3 of the EXP50 modules. Using the touch screen display, it is really easy to setup a VoIP account directly on the phone. This is useful for non-technical users since it means they do not need to use a PC and Web browser to access the online phone portal, everything can be done from the phone, as detailed later in this review. If you enable WiFi, even without selecting a wireless network, it is important to note that the wired Gigabit Ethernet port will be disabled. It would be nice if Yealink added a note about this to the WiFi setting screen as it caught us out for a short period of time (i.e. account would not register). I wish Yealink would just put a power supply in with all their high end phones. An assumption is made that most users have Power over Ethernet (PoE) but many do not and it then becomes frustrating when you forget to order the $5 power supply. The recorder App is useful for recording voice memos but it can actually be used to record calls too, though it is far from obvious. During a call, if you navigate to the recorder App and start recording it will not let you do it. The way to record calls is to swipe the horizontal bar (i.e. the one that has icons for Hold, End Call etc) to the left during a call and you will see an icon for Record. You can then access the recorded call from the recorder App. It actually defaults to internal memory so users should plug in a USB stick if this is a feature of interest so more memory is available to store recordings. Yealink should make this feature more obvious in our opinion. When setting up an account directly on the phone it would be great if we had the ability to change the transport protocol (e.g. UDP, TCP etc). We prefer TCP and the default is UDP so to change it, one has to log into the phone portal using a Web browser on a remote PC to edit this setting. Impressive phone and specifications at a reasonable price (approx $349). Running Android 5.1.1 and includes email, web browser, calendar etc. 7 inch touch screen color display (1024x600 resolution). Up to 27 one-touch DSS keys. EXP50 adds up to 60 more. Full HD video (H264HP) and audio (Opus). Great audio quality. 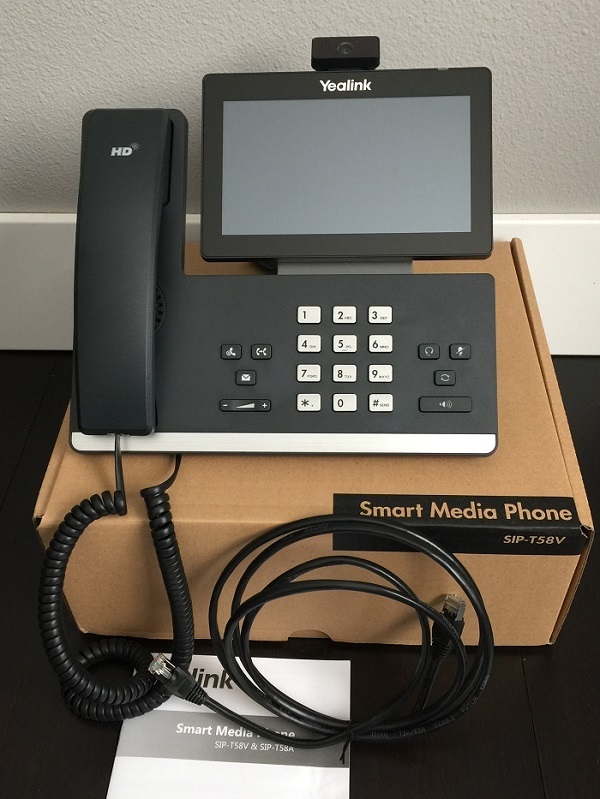 We were very impressed with the Yealink T58V smart media phone. 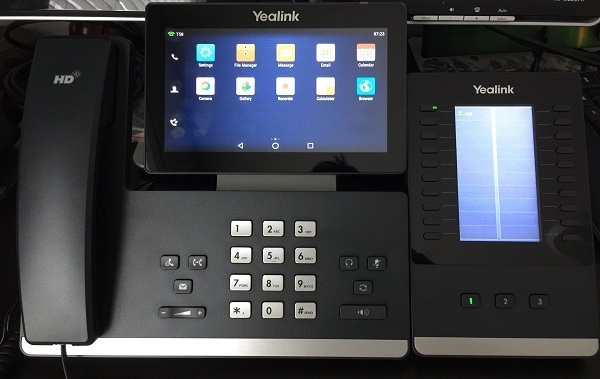 The T5x series is Yealink's move into the Android operating system which makes the phones almost appear tablet like and adds many useful applications to your desk phone. It supports full HD audio and video and the touch screen display makes it easy to setup your system directly on the phone itself. If you need full duplex HD video or looking for a high end device that can handle large call volumes, this may be the phone for you. Consider adding the EXP50 color expansion module to further expand your system. Yealink T58V phone, handset and cord. Stand for phone and CAM50 plug and play camera. Setting up the Yealink T58V is straightforward. Follow the steps in the quick start guide, which is simply a case of connecting the handset to the phone, the supplied Ethernet cable from your phone (Internet port) to your Internet modem or router and powering the phone with the optional power supply or PoE. Once the phone has powered up, obtained an IP address from your network and initialized (around 2 minutes) it is time to configure your VoIP account using the credentials given to your from your phone service provider. For this guide we will set everything up directly on the T58 phone. 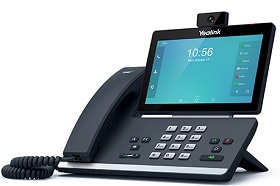 If you prefer to do it from the phone portal, perhaps because you need to fine-tune some settings, you can find an example of this on the Yealink T46G review. Swipe the display to the left until you see the Apps and press the icon called Settings on the touch screen display. Next, you will need to enter the Admin password at the bottom of the settings in order to see the Advanced menu. The default admin password for Yealink is admin (all in lower case). You should now see the advanced settings and press on the Accounts icon. Now press on the first account in the list (Account 1) and enter the credentials for your VoIP service extension so it can be authorized by their server. Figure 2 below highlights the new account screen. Label - Enter a label for this account (e.g. T58). Display Name - Enter any display name (e.g. T58). Register name - From the service provider (extension number usually) (e.g. 116). User Name - From the service provider (extension number usually) (e.g. 116). SIP Server1 - This is usually a sub domain for the provider's server (e.g. test.mypbx.com). SIP Server2 - This is usually a sub domain for the provider's redundant server (e.g. test2.mypbx.com). Press the Tick symbol top right of the window when done and if you entered the credentials correctly the account should register with your phone provider. You can tell if registration has been successful as the little phone icon will turn solid green for this account on the home screen. Once successful registration has been achieved, you are ready to make some calls. In our test system we setup the T58V as extension 116 and another phone was on extension 100. In Figure 3 below you can see the T58V alongside the EXP50 expansion module. On the expansion module we added extension 100 as a Busy Lamp Field (BLF) just as a test. Everything worked flawlessly and the audio between the extensions was crystal clear. As a side note, the BLF functionality is a very powerful feature for small businesses as you can easily pick up calls, speed dial, one touch transfer calls and use it as a presence detect, all with a single button. To learn more, read our BLF article. Finally we tested the Web browser on the T58V and it worked very well, see Figure 4 below. Most likely phone users will have a PC or smartphone for accessing the Web but some people may like having this built into the phone. We're sorry, there are currently no user submitted reviews for Yealink T58V matching your search criteria at this time. Please add your own review or check back later as reviews are being submitted often. Is it possible to retrieve the audio recording made by the phone via a file transfer over the network, rather than having to move it to a USB key? -> Response: I do not believe that is possible unfortunately. Also keep in mind that it can record calls even without a USB stick (I believe there's an internal SD card they use). I recall being surprised by this when we tested it.